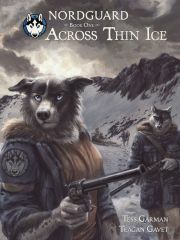 Nordguard: Across Thin Ice has already won two Ursa Major awards in 2012, one for "Best Anthropomorphic Other Literary Work" and it's cover as "Best Anthropomorphic Published Illustration." In previous Ursa Majors, BlackTeagan, as a member of Blotch, has won another four awards. Nordguard was also eligible to be nominated for the Hugo Award's "Best Graphic Story", but did not reach the ballot. Going to be a bit tougher then an Ursa Major I'm sure. No offense, just seems a much larger audience and not so niche. For what it's worth, the other four nominees are all realistically detailed human superhero and horror comic-book artists. BlackTeagan's realistically detailed anthropomorphized dogs really stand out. The award is juried, not a popular vote award, so the larger audience doesn't count so much. But it certainly is nice to have BlackTeagan's work seen by the much larger Comic-Con audience.